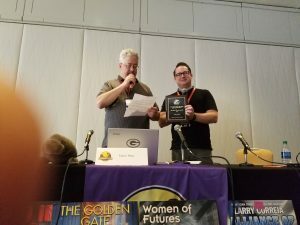 For those who were not, as we were not, present at the Baen Traveling Roadshow at DragonCon, reproduced below is our speech accepting the Readers Choice Award for “Wise Child.” Jim Minz (pictured below) accepted on our behalf. That means he got to reach the speech, which he did with his usual good humor. Here you see Jim Minz accepting and David Afsharirad showing off the plaque. Well deserved honor. May you receive many more! Previous Previous post: What in Ghu’s name has the woman been DOING?